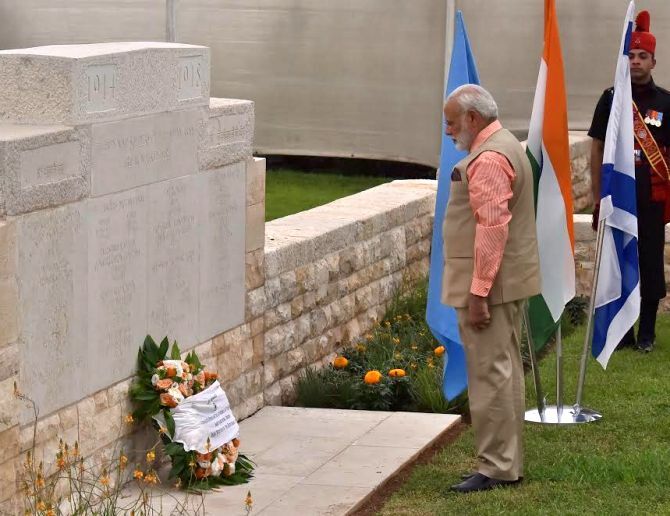 Modi visited the Indian cemetery in Haifa along with his Israeli counterpart Benjamin Netanyahu on the last day of his visit to Israel and laid wreaths at the site. "Together in homage to the fallen brave. 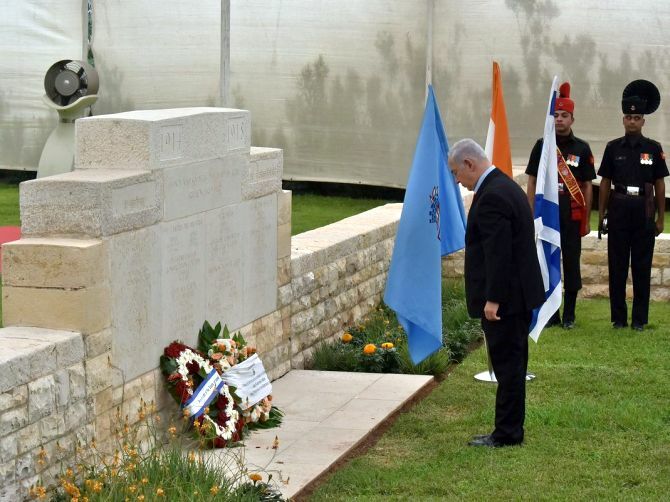 Wreaths by PM @narendramodi & PM @netanyahu at Haifa," External Affairs Ministry Spokesman Gopal Baglay tweeted. 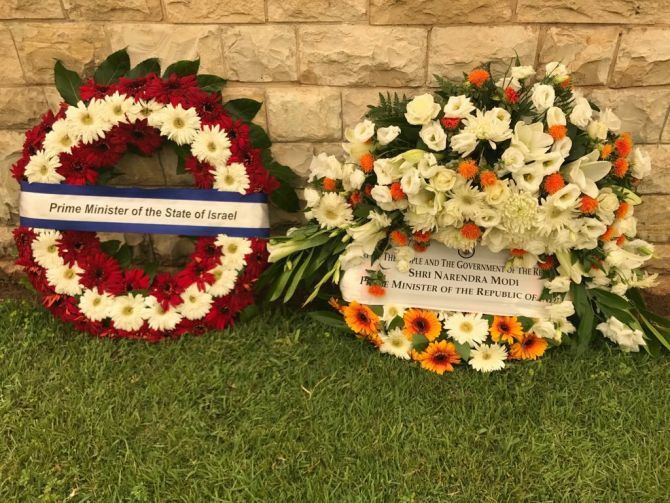 He also unveiled a plaque commemorating Major Dalpat Singh, known as the 'Hero of Haifa' for his critical role in the liberation of the city. 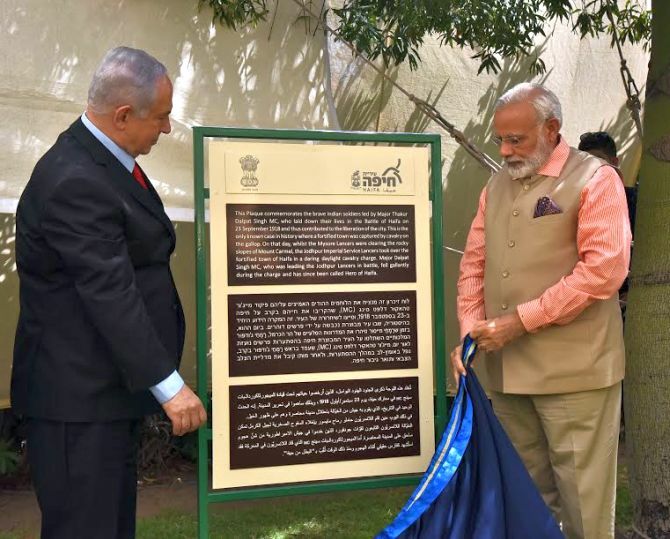 "I am deeply honoured to stand here today to salute the valiant Indian soldiers, who led down their lives for the liberation of Haifa during the WW I," Modi wrote in the guest book. "The exceptional bravery and supreme sacrifice of Major Thakur Dalpat Singh MC, the "Hero of Haifa" and his men, will be remembered forever and continue to inspire generations to come. 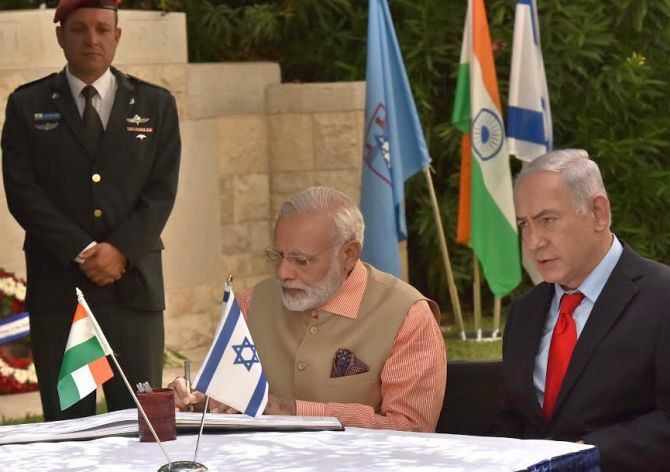 Next year, the centenary of the battle of Haifa will present another opportunity to mark this enduring bond between India and Israel," he wrote. The Indian Army commemorates September 23 every year as Haifa Day to pay its respects to the two brave Indian Cavalry Regiments that helped liberate the city following a dashing cavalry action by the 15th Imperial Service Cavalry Brigade. In the autumn of 1918, the Indian Brigade was a part of the Allied Forces sweeping northwards through Palestine in what is seen as the last great cavalry campaign in history. Captain Aman Singh Bahadur and Dafadar Jor Singh were awarded the Indian Order of Merit and Captain Anop Singh and 2nd Lt Sagat Singh were awarded the Military Cross as recognition for their bravery in this battle. Major Dalpat Singh was awarded a military cross for his bravery. In 2012, the municipality of Haifa decided to immortalisethe sacrifices made by Indian soldiers, many of whom are buried in the cemetery here, by including the stories of their valiant efforts in school curricula. PHOTOS: On Day 2 of Modi's Israel visit it was all about the hugs!